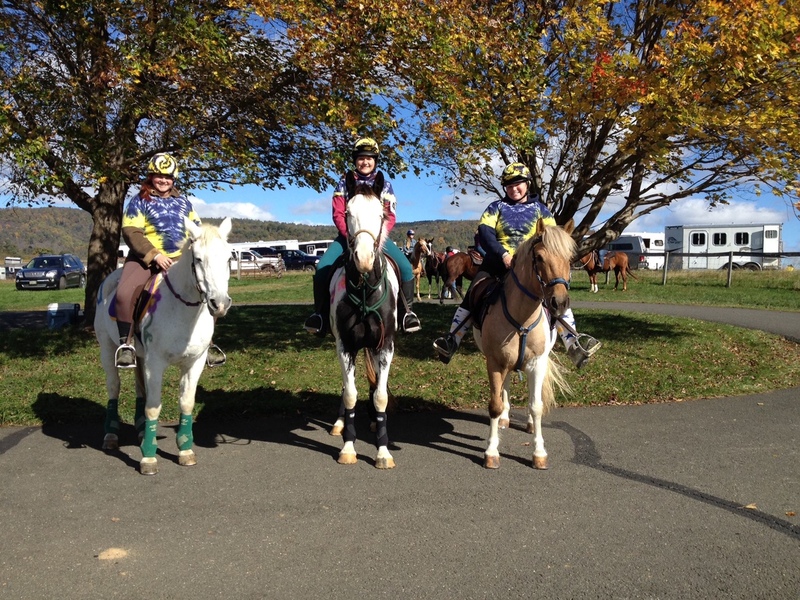 This past Sunday was the Nokesville Horse Society’s JPR (Judged Pleasure Ride) at Sky Meadow State Park in Virginia. 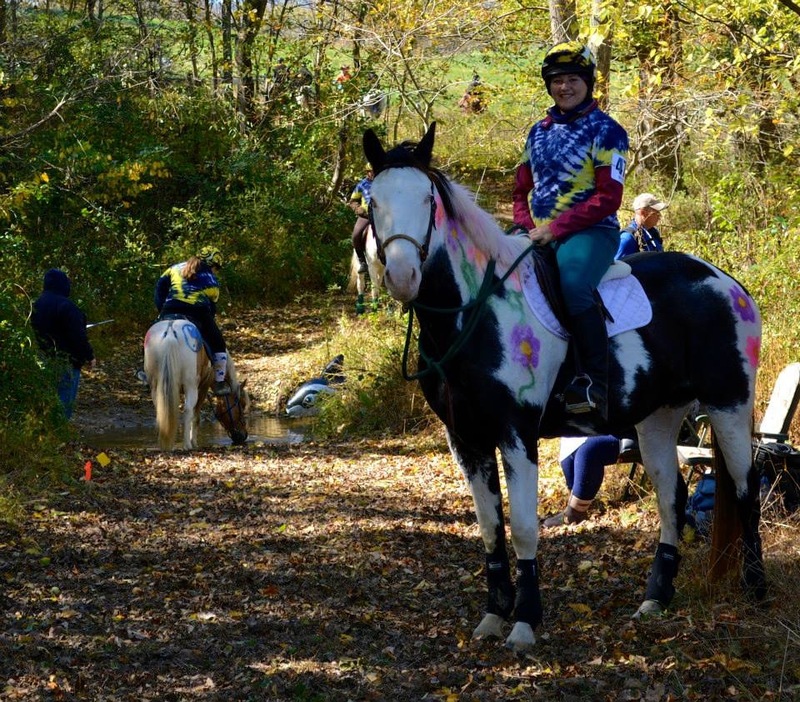 It was the 5th and final leg of the 2014 Crystal Crown Series. I did this ride last year, when it had a Wizard of OZ theme. It was awesome! This year the theme was the 70’s. And it was awesome! Val and Zoe met up with me, and we rode out together after getting our 70’s on. 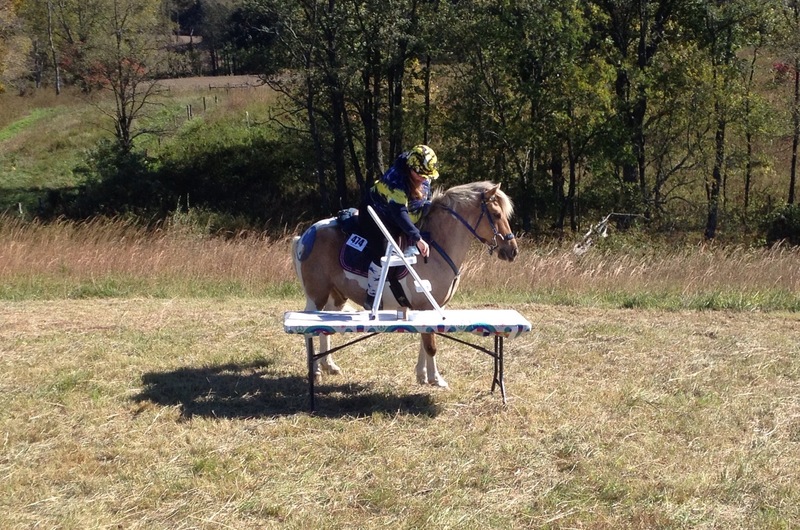 Half of the points for the final obstacle were decided on if rider and horse had on three visible 70’s items. 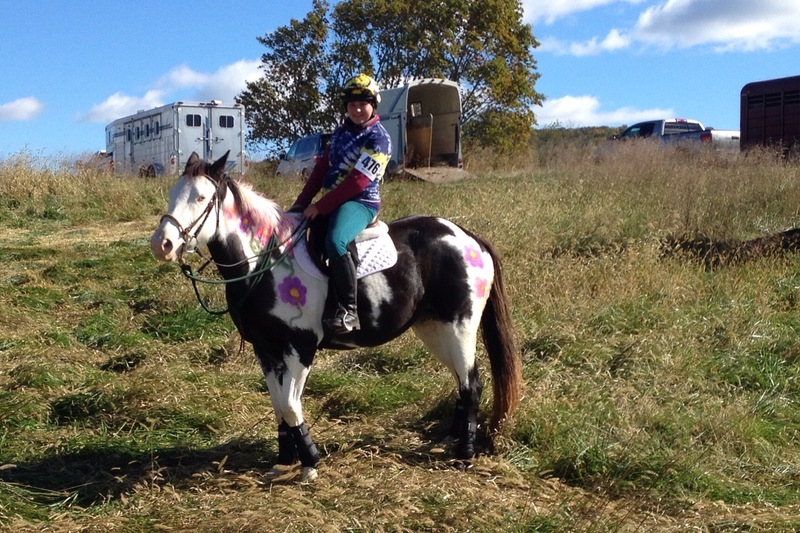 We planned ahead and borrowed a set of tie dyed matching t-shirts and helmet covers from the Old School team gear, and Val brought paint which she and Zoe applied to our ponies in the form of flowers and ying yangs. We looked good. 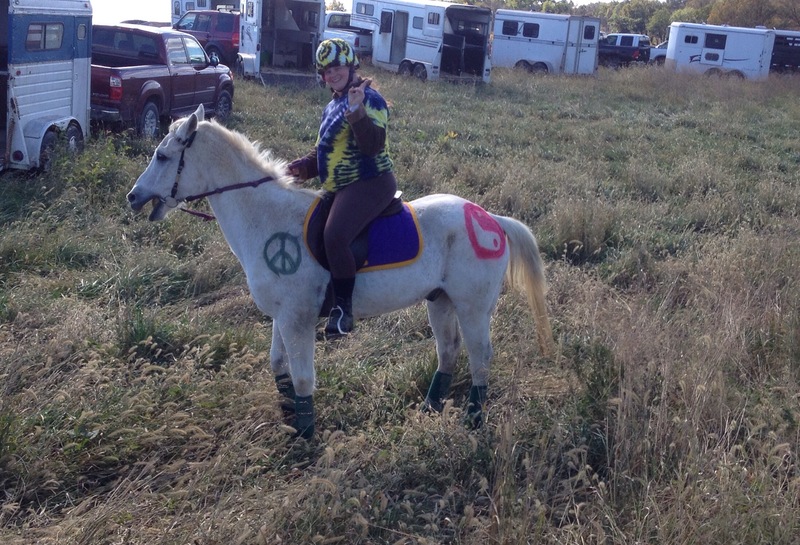 Other riders had on giant wigs, flowers, big sunglasses, and peace signs, not to mention tassels and fringe!! The first obstacle, “Saturday Night Fever” was a wooden structure, much like a run in shed open on both ends, or a covered bridge maybe, with the walls and roof made of tarp. There was a strobe light and music playing inside and shiny tassels hanging down. 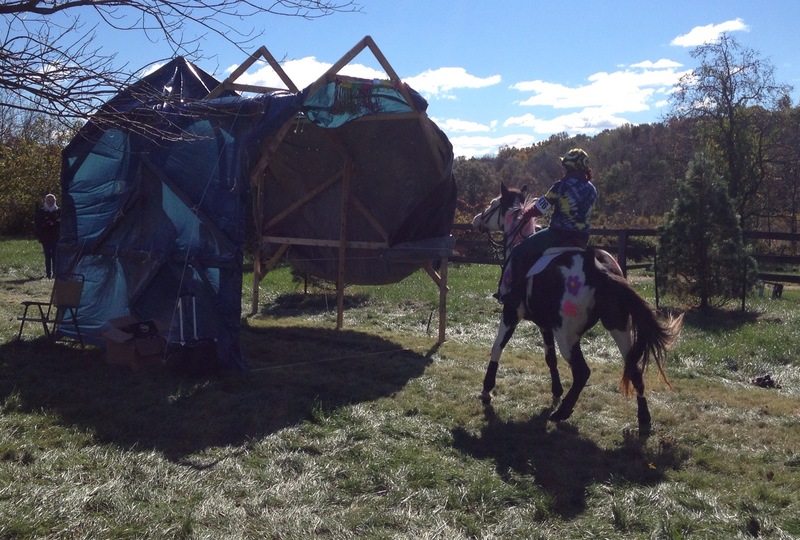 It was an extremely windy day, and Simon and Rhea (Zoe’s pony) were having nothing to do with it. 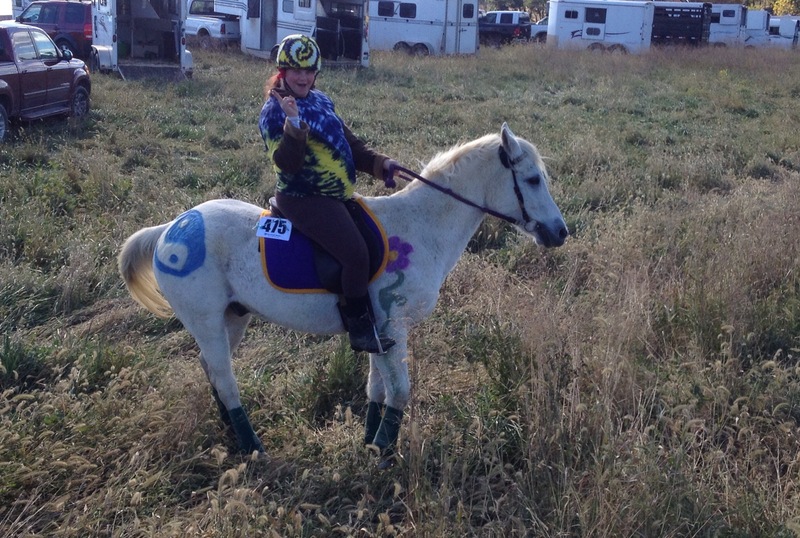 Of course Val and Sprite walked right on in and scored a perfect 10. Val ended up leading us both through afterwards for the experience. Simon all put pooped his pants as he ran out, completely sure that he was leaving Sprite to his fate with the pony eating monsters inside. The second obstacle was our favorite. It was basically light saber jousting called “May the Force be With You”. There was a barrel with a light saber on it. 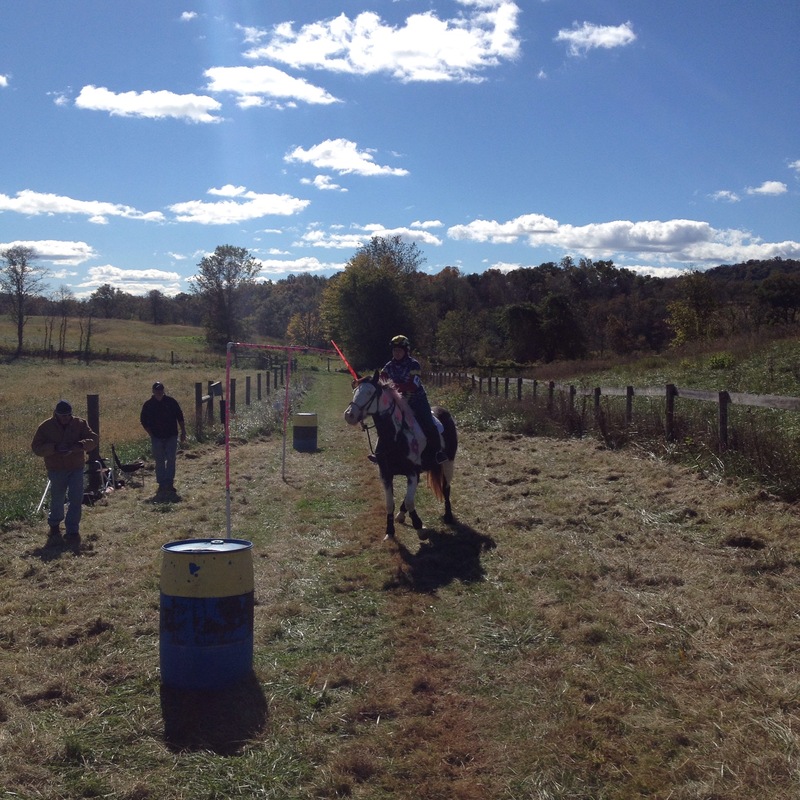 The rider, picked up the light saber, and then at a minimum of a trot, needed to spear two rings, ring jousting style, and then place the light saber on a barrel at the end. 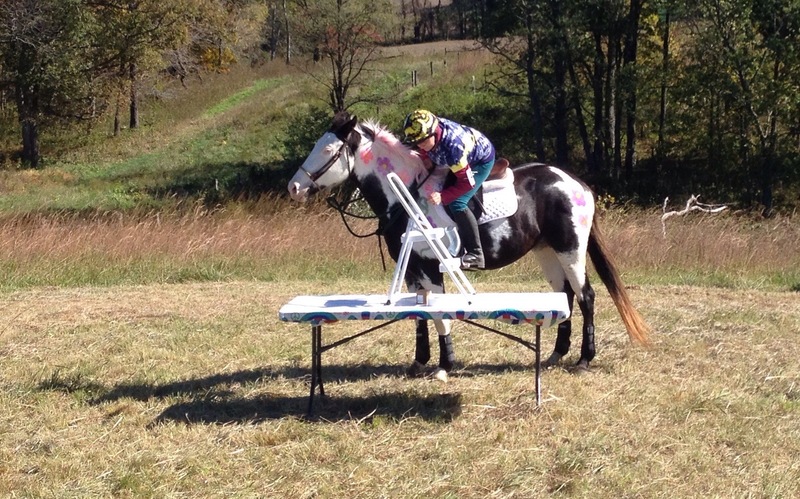 Using our mounted games skills, we crushed this obstacle like pros. 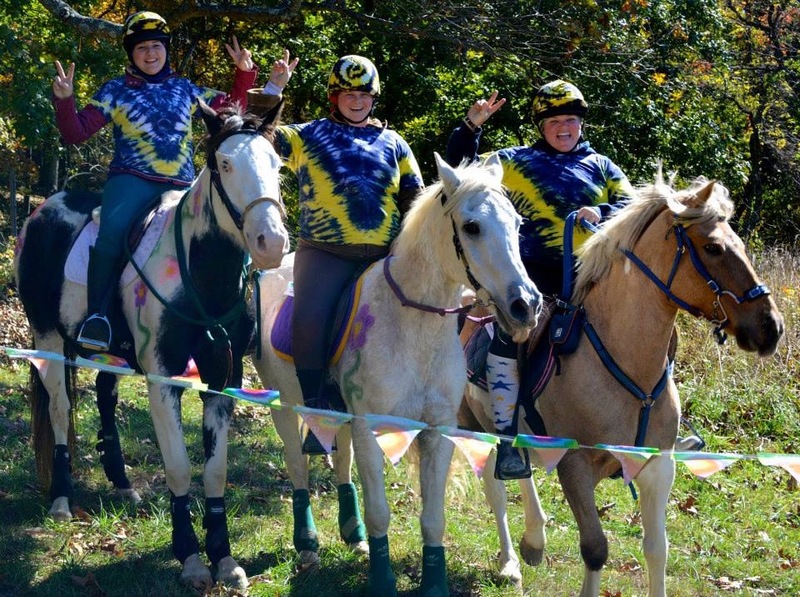 The volunteers at this obstacle were extremely awesome, and let us run back and forth through it a few times, laughing ourselves up and cheering each other on in true mounted games rider fashion. 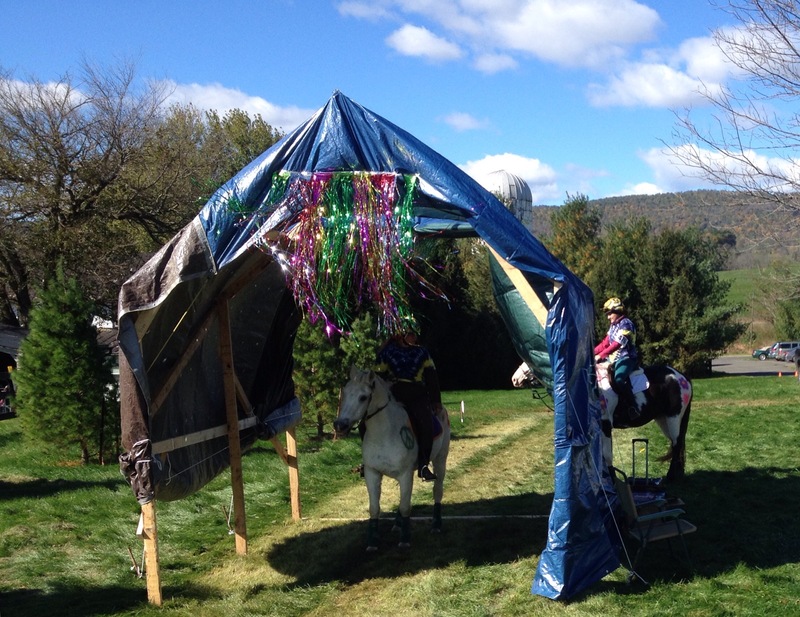 The third obstacle, “Pin Ball Wizard” was supposed to involve pushing a giant horse ball through a cover leaf pattern, but the high winds required a change, and riders just needed to trot the pattern. Seemingly easy, I trotted off first, and on the back, right hand barrel turn, Simon’s games skills kicked him and he tried to launch out of his turn into a canter, so I got a minor dock on that one. “Everyone Knows it’s Slinky” was another fun obstacle. It involved a table, with a step stool on top of the table and a slinky on top of the stool. The rider needed to ride up and slinky (to their best slinkying ability) the slinky down the steps. We all did pretty well at this one too. The ponies were a little ansty, expecting us to grab and go, but all in all, we cleared this one in pretty good fashion. 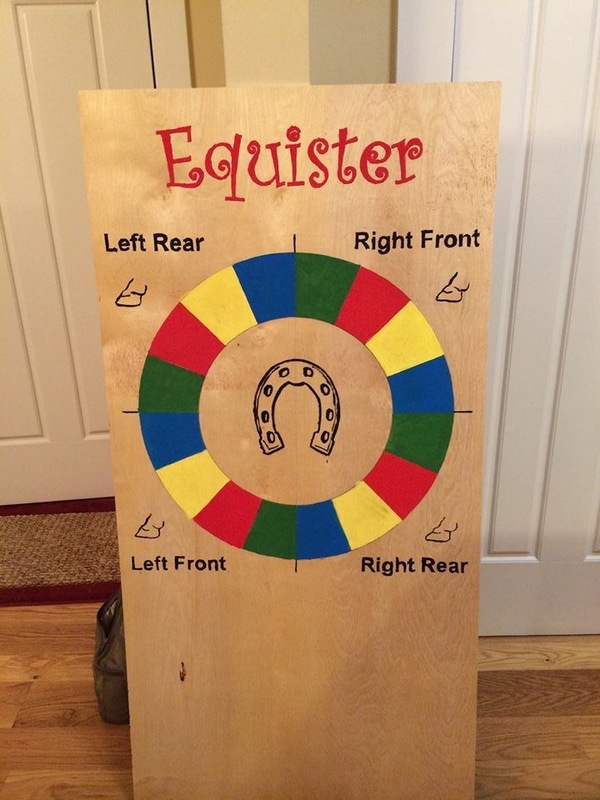 “Twister” was the next obstacle along the course, and included a really well made spinner! 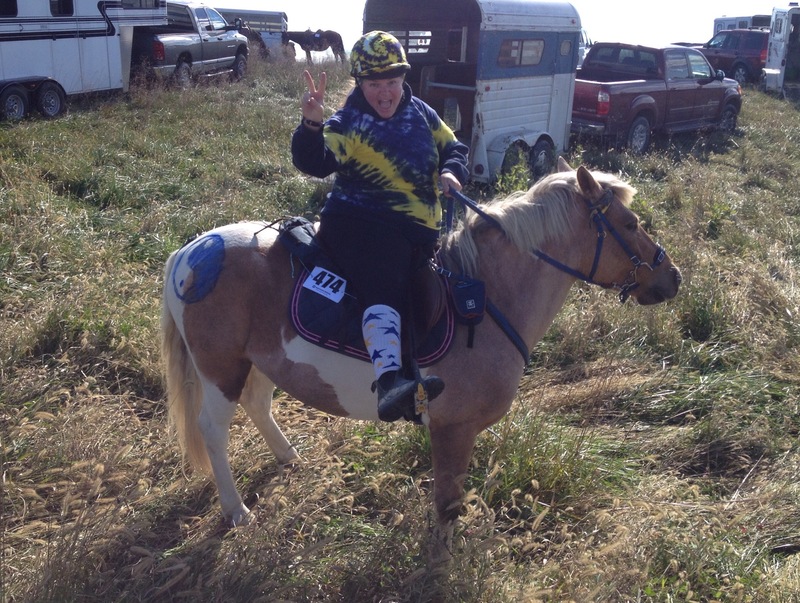 The rider spun the pin, and it landed on a color and hoof. 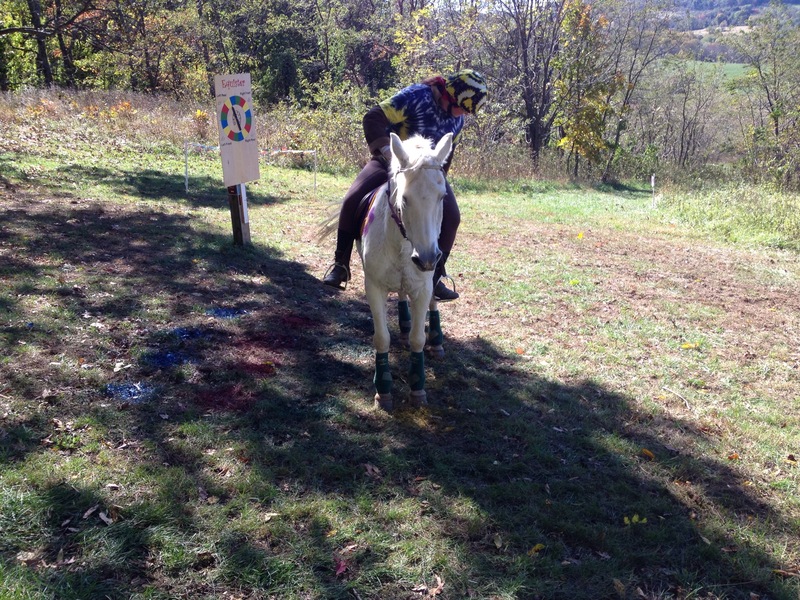 Then the rider needed to place that particular hoof in that particular color. I went first and Simon did challenge me a little by deciding to rest his hoof on the toe in the circle, before I got him arranged properly. Sprite was also a little antsy. Rhea wanted to spin the spinner herself but then squared up in her circle nicely. Easy-peasy and on we went on a nice hack through the woods and hills. We all rocked on through “Grovey Garden” without a bat of the eye. Reflective hanging, and spiny things lined both sides of the wide trail, with music playing and everything blowing around. I was really impressed with Simon, because I expected him to at least be a little looky, but nope. 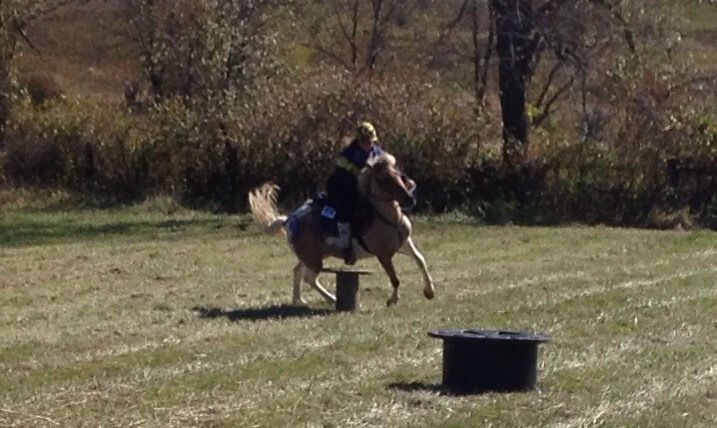 Rhea being only five months under saddle was very impressive as she marched on through. And of course Sprite, thought nothing of it. “Halloween (the movie)” was a challenge that I felt went better than expected. There was a post with a rope over it. The rope was a long noose hooked around Michael Meyers neck, which was a stuffed dead body on the ground. The rider needed to collect the end of the noose, drag the body forward, and then back back up to the starting point, returning the rope to the pole. 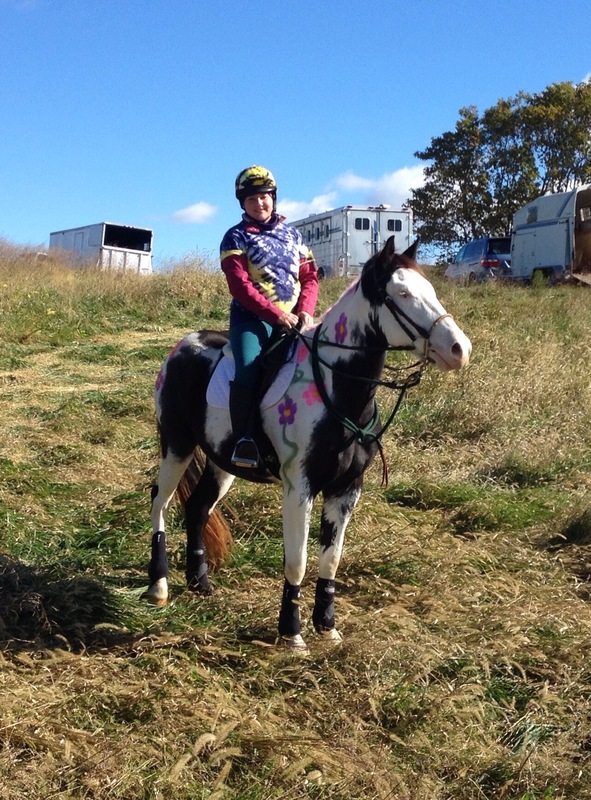 Simon, the x-driving pony, who has shown nothing but continual terror at dragging things since his career change, was excellent at the drag and other than being a little off angle, backed up like a champ. I was slow at picking up the rope and then returning it to the post, taking my time to get it properly on, and went over time by a few seconds. Boo. Zoe did the same thing, after Rhea performed expertly. Val just made time with a quick turn at the end and leap over the flags. 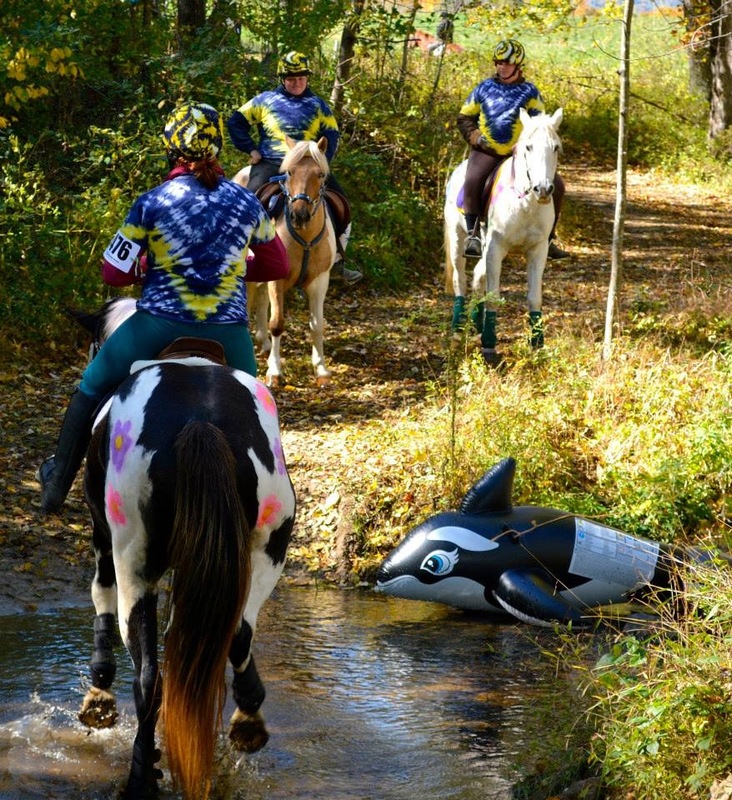 The next obstacle was the water one, “Orca (the movie)”. There was a creek crossing with a blown up pool orca in the water. 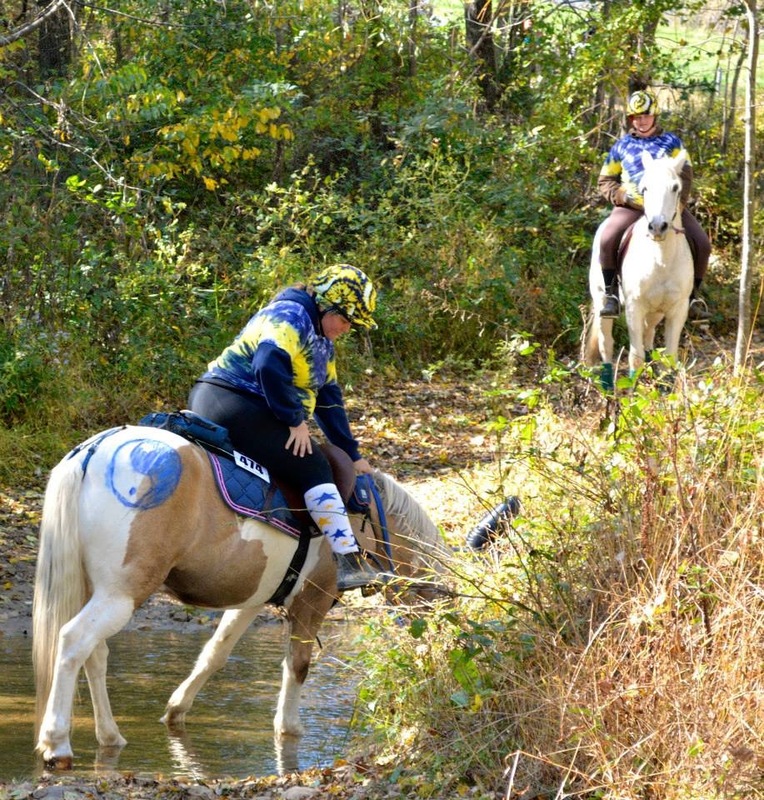 The pony needed to fully enter the creek, stand for the count to five, and then walk out. Sprite, who had pretty much dominated the whole course was a little antsy and not very interested in standing still getting Val docked a few points. Simon and Rhea stood like champs and then Simon insisted on a long drink afterwards. The “Harlem Globetrotters Slam Dunk” was the next obstacle, and it required the rider to pick up a ball from a barrel, ride to a ground pole, halt, and then toss for a basket. None of us made the dunk, but we all rolled through pretty smoothly. Val and I both got docked for not pausing long enough at pick up and drunk, with Zoe showing us up with her and Rhea’s laid back performance. The final obstacle was the “Cool Cat’s Hula Hoop”. 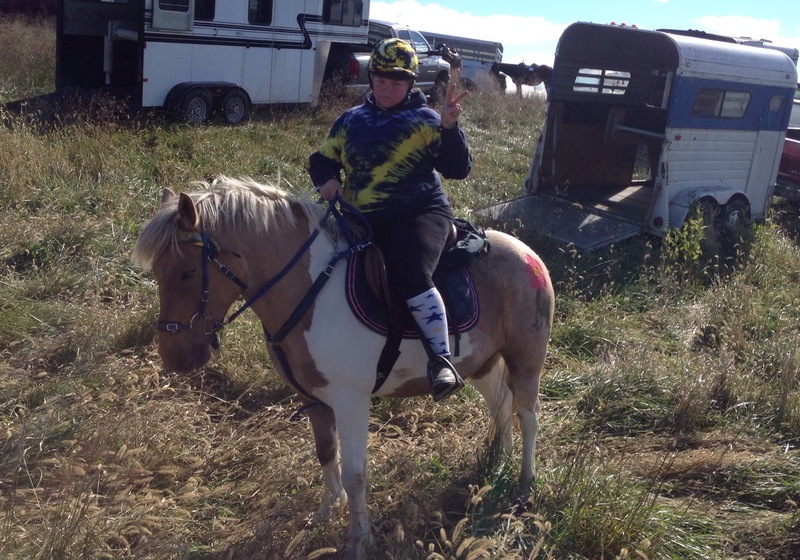 We got stuck in a bit of a traffic jam before this one and our ponies were bouncing around waiting for their turn. Note to self for next time, ride back down the trail and around and come back when the line should be shorter rather than wait in line. By the time we were up to go, all three of us were dancing around. We each had to ride up to a post, pick up a hula hoop, side pass over a few steps, stop and whirl the hoop around for the count to five (or maybe it was three) and then side pass back, and hang the hoop back up. My first half was excellent, but my pass back was a bit forward, with Simon being ready to move on. We finished up and were greeted by the organizer, Kari, who asked how things went, our favorite and least favorite obstacles, etc, and then were provided an AMAZING lunch. The cookies with the coconut in them… three thumbs up on those in particular. This ride was AWESOME! The organizer, and all the volunteers were fantastic and all dressed in theme! 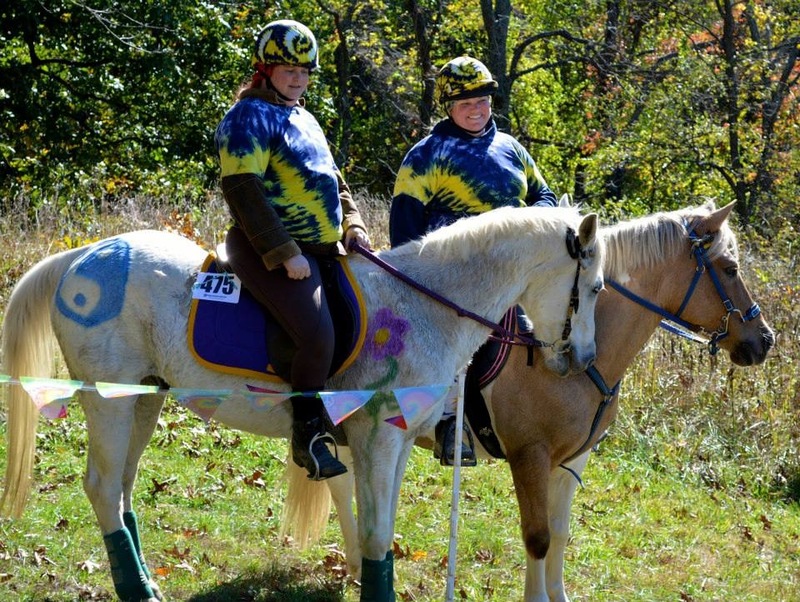 All three of us had an amazing time goofing off together, playing dress up, and challenging our ponies and ourselves. One thing we did find challenging was the rule to “not coach” each other through obstacles, and restraining our loud cheering support. We also wish there were more of these JPRs available, but unfortunately three of the five fall on the same weekends as Mid-Atlantic competitions. Maybe we will get luckier next year! A HUGE THANKS TO ALL THE VOLUNTEERS!!! I snagged the first seven photos from organizer Kari and volunteer Bobbi off Facebook. The others were taken by us while we were riding.